Why do pirate captains make the scariest ghosts? Think about it! Think of all the ghosts you know. Hang on, do you know any ghosts? If you know actual ghosts you should be like the Long Island Medium or something. What do they tell you? Do they talk about the other side? Or is it like ghosts in the movie Ghost (starring Patrick Swayze, Demi Moore and Whoopi Goldberg. If you haven't seen it, it's a classic. ), where they're only ghosts because they haven't yet done the whole crossing over part? At least that's what we think happens. The movie is kind of spotty with its explanation of ghost science and we think there's a pretty good chance they were making some of that stuff up. 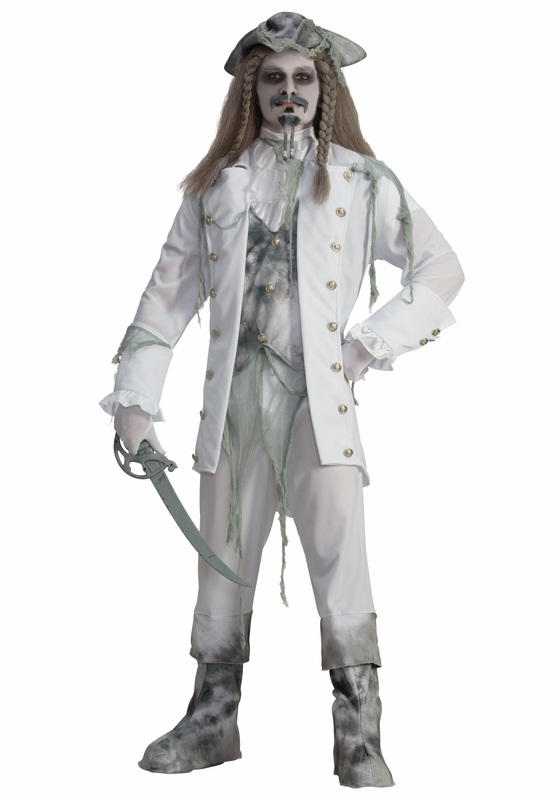 Anyway, if you know some ghosts, and if you asked those ghosts what the scariest ghost costume would be, we're willing to bet they'd all say ghost pirate captain. Why? Well, some things are better left as mysteries, lest you find yourself at the bottom of Davy Jones' locker. But listen, being a pirate, especially a ghost pirate, isn't just putting on a costume. You gotta sell this. Especially with all your ghost friends watching. They're going to know if you're phoning it in (do ghosts know what phones are?). Make sure you know your port from your starboard (that one is the right side), and say "Arrgh" at least once every time you speak. And if anyone asks how you died, say it was scurvy... hang on, that's not a scary death. Say you were forced to walk the plank and a cannonball hit you at the same time you were swallowed by a shark. Yeah, that sounds awesome. Besides, no one's going to fact check you. You're a ghost pirate!